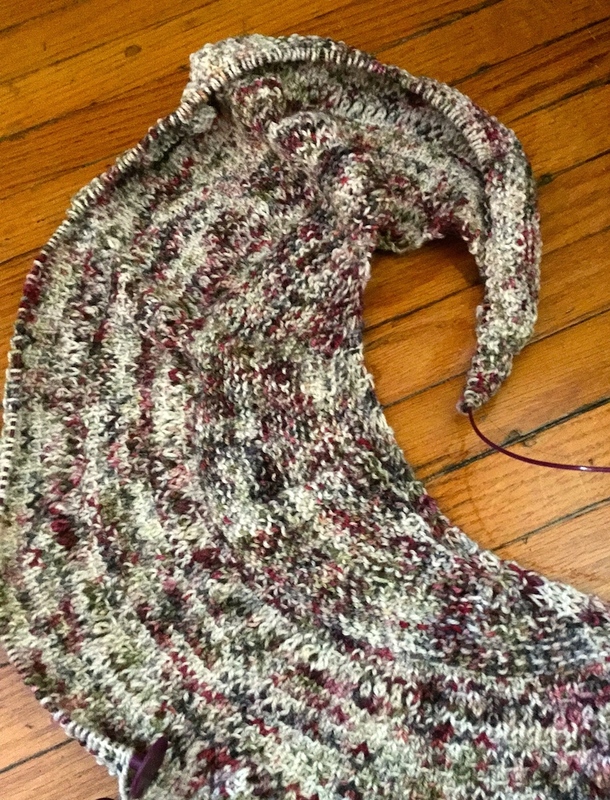 Unfinished Yarn Projects: I have ten…how many do YOU have? Anyone who crafts knows what it’s like to have unfinished projects around the house. Especially my fellow knitters and crocheters. You know the projects I’m talking about. They’re a bit too complex, requiring more attention than you can provide or they’ve proven to be too simple, unable to capture your attention for any length of time. I got thinking this morning about the various projects I have in my home that are unfinished, and the various reasons why they remain that way. I knew I had a few around the house. I don’t think I realized exactly how many. So, yes, unfinished projects in various states of completion. They sit patiently, each in their own bags with their printed pattern (yep, that’s the Capricorn in me), on shelves, in bins or on the couch next to me, waiting for me to pick them up again. Sometimes I do, but often, they continue to wait. Silently. Begrudgingly. So, today I decided to pull them out and give them a bit of freedom. A bit of sunlight. A chance to show off for the camera and maybe, just maybe, by showing them off to the world, I will be inspired to start things up again with each of them! It also gave me a chance to reflect on the various reasons why we don’t finish certain projects. Half, well almost, half of a shawl. Made with a 4-ply cotton yarn, the idea is that each half will shift colouring from bright red to black from top to bottom. This poor shawl has been languishing in my craft room for probably a year and a half now. The pattern isn’t too complex but involves loads of triple treble crochet stitches….so a lot of work equals little visible progress. 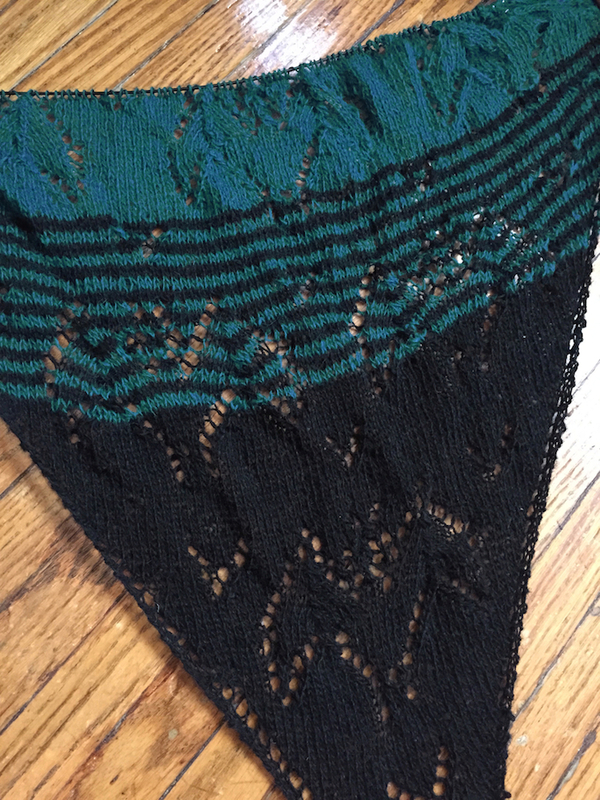 The other problem with this shawl is that I realized this far in that the cotton won’t necessarily block well. It won’t stretch and really show off the pattern like a wool yarn would. So, I had put too much work into it to pull it out and was too disillusioned to move forward. This lovely ongoing shawl is number 1. 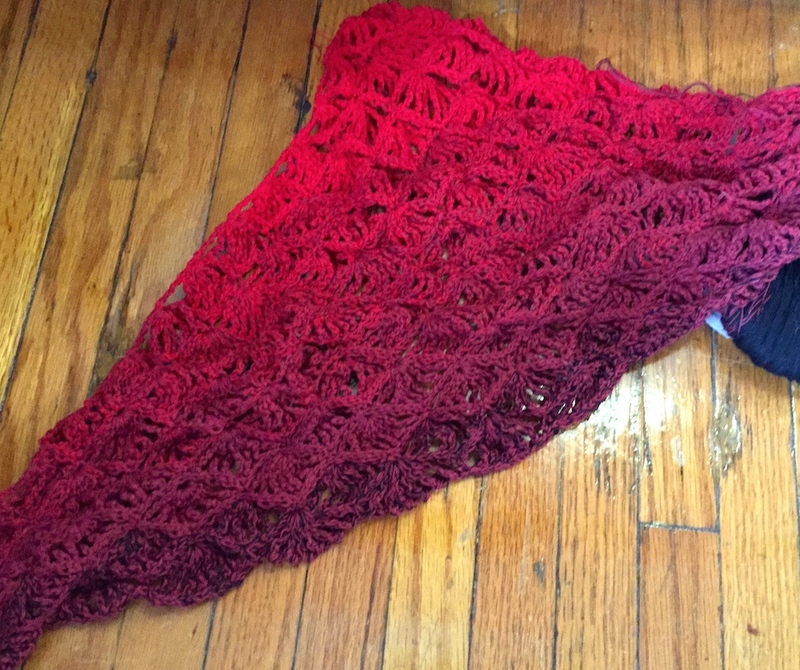 This asymmetrical shawl isn’t as old as the first project. I started this last spring I think, probably around April or May. I plan on continuing with the large stripes, I love the colours together, and the pattern is a simple two-row repeat with a stitch added every row, so why haven’t I finished this one? It’s one of my first knit lace project with lace weight yarn and small needles. The needles are 3mm and I find the yarn a little splitty, which is frustrating. I also have found myself getting frustrated with my own abilities…somehow I constantly miss a stitch and find the two-row repeat not working because I don’t have the odd number of stitches that I should. Even when I pay close attention and seem to have done everything right, I move on to row two and don’t have the right number of stitches. So, frustration. That’s why this lovely shawl sits and waits. Number two. EDIT Dec 2015: Complete! AND I added fleece backing for the first time as an experiment. Really happy with how this turned out! Have written a post on it here. Again, this one isn’t too old. I’ve been working on it for a month or so and I know that if I applied myself, I could likely finish it in a day. The problem with it is two-fold. First, due to the colour changes, I have been carrying the unused colour throughout, which makes it a bit more difficult to work with. Second, it’s mainly single crochet stitches. So, I get bored. When completed, I plan on experimenting with this scarf and attaching a fleece back to it to make it warmer. It is meant as a gift for a friend (you know who you are!) and winter is coming, so I have that as motivation to finish this project. The plan is to have it done in the next couple of weeks. Dalek vs Tardis…that’s number three. Okay, this one doesn’t necessarily count. 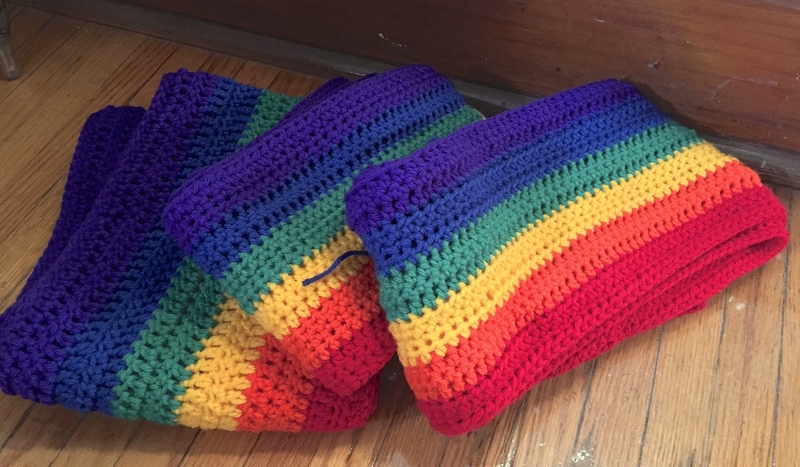 These three rainbow scarves are an order and are *almost* complete, they just need to have their fringe added, something I keep putting off. My plan is to do this once I have posted this blog post….soooo, as you read this, they are likely complete and my list has shortened to nine! Another project from years gone by! 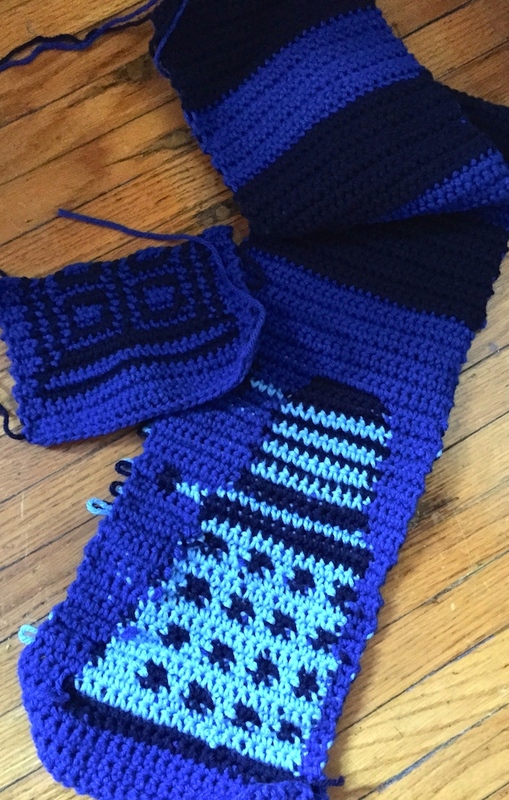 I started this wrap not long after I learned to crochet…so we are talking years. I don’t honestly know why I haven’t finished this wrap. The pattern is straightforward and fairly simple, stars made and attached together, each one taking half an hour or less…15 mins each if I really focus on what I’m doing. The yarn is laceweight…a gorgeous alpaca with a slight halo and amazingly warm for a yarn that weighs practically nothing. 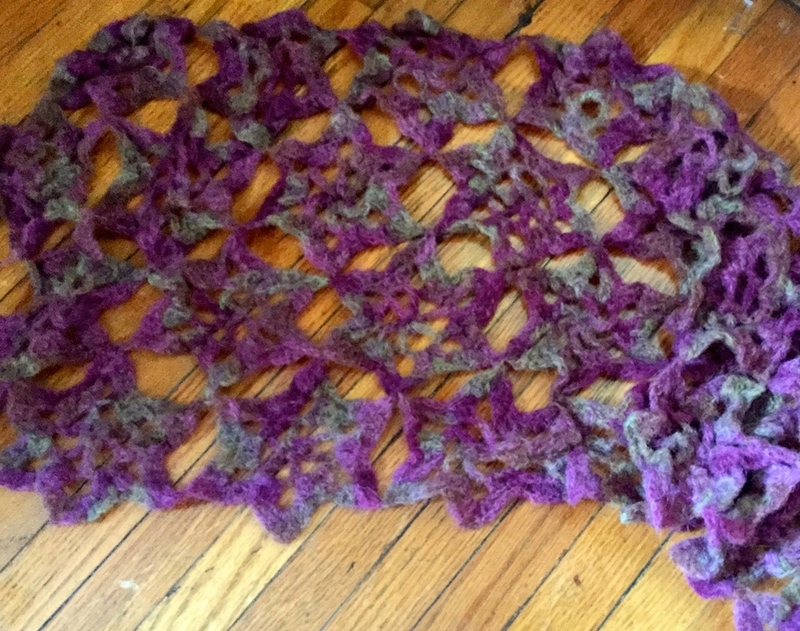 For those familiar with my Solid Body Skull Scarf pattern, this skull shawl is made from the same yarn. I was curious to see how the variegation would translate in this pattern. I know for sure that this shawl isn’t finished due to boredom and repetition. I have this pattern memorized. Typically though, one shawl includes five rows of skulls, sometimes six. This yarn is thinner and at seven rows, it’s not done yet….likely needs at least one or two more to make a good size. So, same ol’ pattern with a tiny crochet hook 😉 Yep, boredom is the problem here! It’s ALMOST done though…so perhaps THIS will be the project to tackle after the rainbow scarves. Hmmmm…. Dec 2015: COMPLETE! And shipped to a lovely lady in the U.S. for her birthday! Icelandic spring shawl, made with Plötulopi. This project has been waiting for me since I returned from my knitting trip to Iceland in July. It remains incomplete due to somewhat practical reasons…. The challenge was to knit a shawl in Plötulopi, an unspun yarn that is fragile to knit. 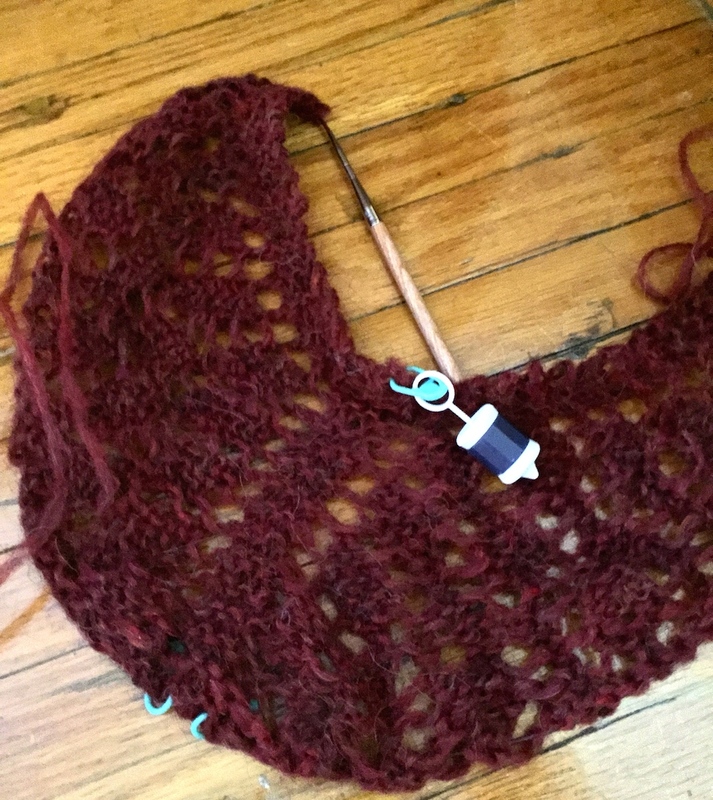 I’m still fairly new to knitting and my tension was quite tight, so I figured if I worked with lopi as a one-ply, I would HAVE to loosen my tension because otherwise the lopi would continuously break and I wouldn’t get anywhere with it. So, I started the shawl and as you can see, I was able to work with the lopi. It took a lot of experimenting to figure it out but I finally loosened my hold on the needles and the tension in my muscles to allow for successful lopi knitting. Then I went on my trip and got distracted with other projects. So at present, the problem is two-fold. One, the loose knitting takes a lot of time as I have to go so slowly. Two, since I haven’t worked on this in a while, I need to spend some time figuring out how to loosen my tension enough to make it work again. 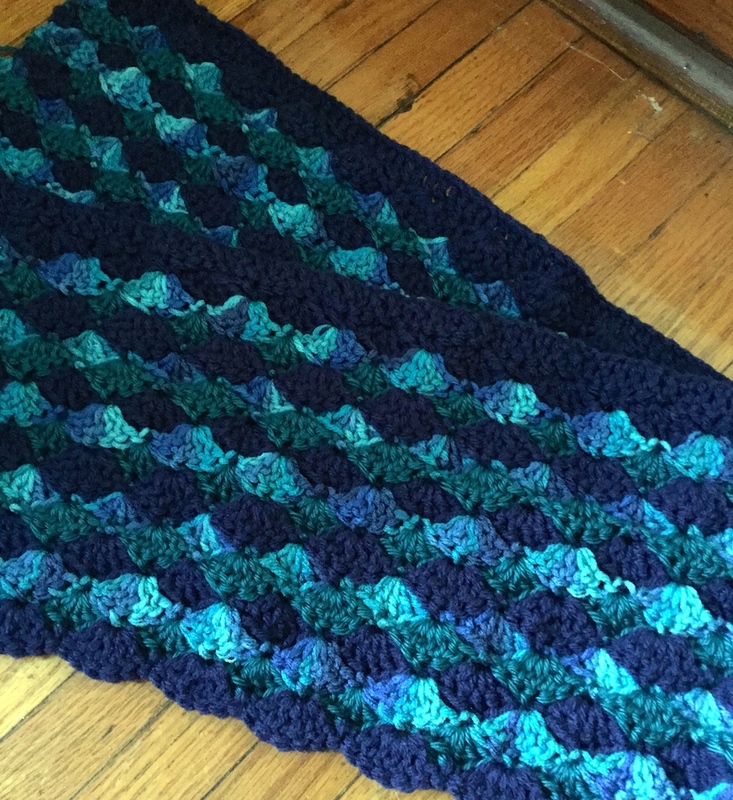 Many friends have requested a mermaid blanket or throw…a blanket that ends in a fishtail which wraps around ones feet. I was curious to try making one so I purchased the yarn needed and began working on one. So, this one is ongoing…I do a row, I put it away. Crochet. Put Away. Repeat. This is the beginning of a shawl pattern by Stephen West. I look forward to finishing it but like project #8, I don’t look forward to the amount of time it will take. 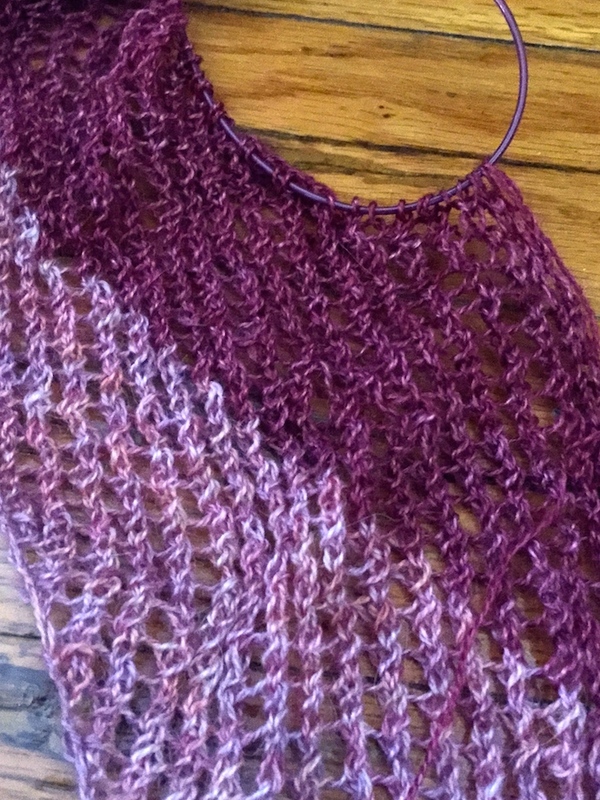 As a new knitter, I’m not a fast knitter and this shawl has and will amass a heck of a lot of stitches per row. This is also one of the first knitting projects I attempted with yarn lighter than DK, making it the very first project that taught me how SLOW knitting is compared to crochet! A row takes me a while, so I have to have a good chunk of free time when I sit down and work on this one. 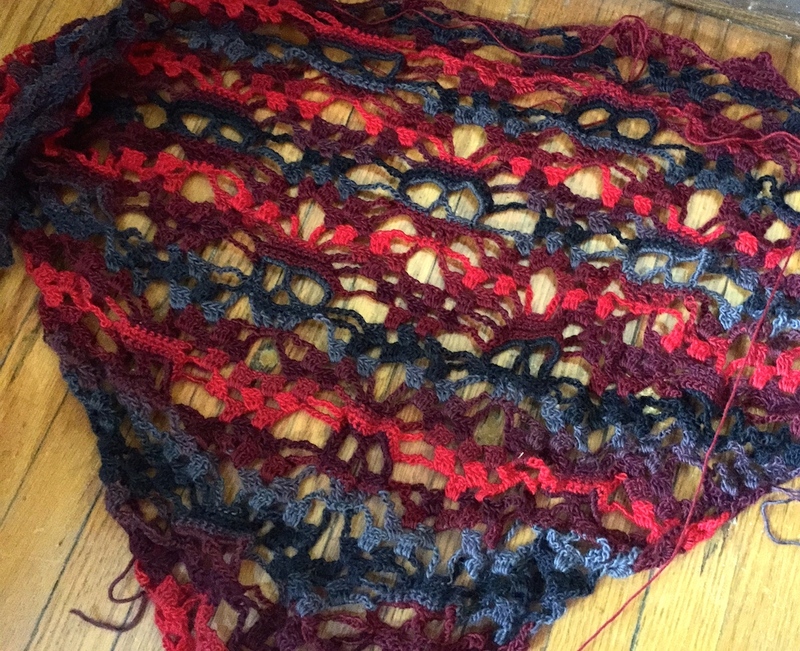 I love this shawl…I love the colours…and I love the bat pattern! It has proven to be incredibly challenging for me, even though the pattern is technically made with strategically placed yarn overs. It also only included a chart for the first three bats, which resulted in a rather tiny un-usable shawl, so I spent an evening manipulating the chart in a graphics program to help me visualize the shawl with more repetitions. I still don’t know how many repetitions I will need to do to make it a good size, so I think that unknown piece of information keeps me from really sitting down and working on this. Plus the colours and striping were created by me as I went, and since I don’t know how much more I need to make, I can’t decide if I should continue the stripes a little longer or switch back to black…so I continue to hesitate and be indecisive and Blaka continues to stare and me and make me feel guilty. This is the project that has likely spent the most time sitting in my lap and being stared at. I just can’t decide what to do! So there you have it…ten unfinished and very different projects. All unfinished for different reasons. All with promises of completion to keep them going. How about you? How many unfinished projects stare at you from your shelves and yarn bins? Previous postGetting Creative in Montreal – Need your help! Next postSolid Skull Scarf Crochet Pattern – Now available in German! The worst are the projects that I forget the pattern or stitch. I’m novice enough not to be able to figure some of them out. Like a scarf I started in October. While on a trip. And put it aside when we got home. Ha! Now for the life of me I can’t figure it out. I usually print the pattern if I’m using one and put the partly made item, yarn and pattern into a freezer bag so that I can remember what I was doing. Hehehe! That was me as I searched my house! About 6. lol. I’m one to complete a project and not sew it all together after I am done and let it sit there for a month. I have a whole pile of gifts just waiting for me to do that. My star wrap on this list is like that. You have to attach the stars together after creation. I haven’t made a blanket yet but I would like to. I have a few patterns that I would love to try! Every time I go in a yarn store I see a pretty yarn that I just have to buy! Usually I get inspired while I’m there but by the time I get home, I forget the inspiration. Lol. I’ve started matching yarns with patterns, printing the patter and putting each ‘set’ in its own little bag. I use mainly bread bags for projects bags. They’re small and easily stored. Plus they’re transparent so you can see what’s in them at a glance. There are SO many yarn stores here! I can definitely see how not having them nearby would be a good thing 😉 I’m a regular customer. I have a few projects not completed. My thing is buying the beautiful yarns and not starting the project.